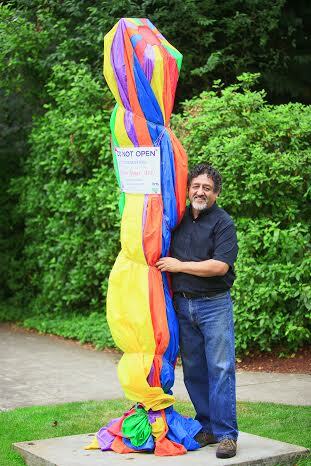 The rainbow fabric comes off this Friday, September 5, to unveil the newest additions to Lake Oswego’s rotating Gallery Without Walls. Rainbow fabric has draped Lake Oswego’s newest additions to the Gallery Without Walls in secrecy for the last couple weeks. Come Friday evening, September 5, from 5:30 p.m. to 7:30 p.m. the secret’s out as the Arts Council hosts a celebration in Millennium Plaza Park at First and Evergreen to reveal the new sculptures to this rotating gallery. ●Fourteen new sculptures on loan to the city of Lake Oswego’s Gallery Without Walls will be unveiled and explained by the sculptors who created them. ●Guided walking tours will be offered of the Gallery Without Walls. The Human Statue will kick things off at the Unveil Your Art Celebration beginning at 5:30 p.m. in Millennium Plaza Park. 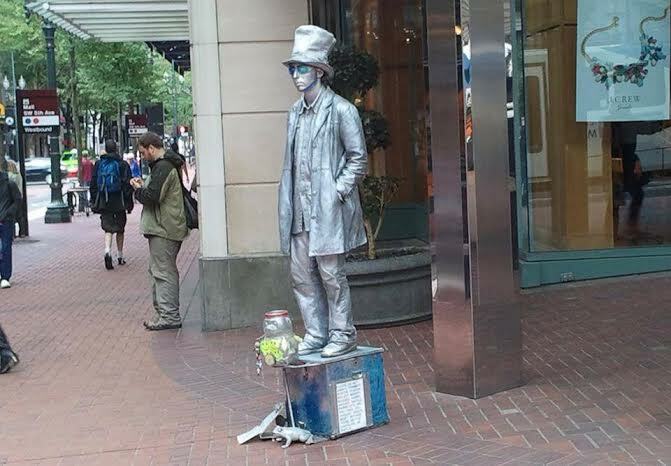 ●Entertainment provided by The Human Statue, also known as The Silver Man, seen on Portland streets juggling, miming and just, well, standing still and making you wonder, is he real or is he a statue? ●Food available from Nicoletta’s Table. ●A chance to channel your inner hippie and pull out your tie-dye, floral prints, miniskirts and bell bottoms in honor of this year’s Pop Art theme, made famous by artists like Andy Warhol and Roy Lichenstein. Have you signed up to receive weekly updates of “52 Reasons to Love Lake Oswego?” If not, click the “Sign me up” button in the top right hand column and you’ll be sure not to miss a thing. This entry was posted in Lake Oswego Arts, Things to Do in Lake Oswego and tagged Lake Oswego Gallery Without Walls, Lake Oswego Oregon, Lake Oswego Unveil Your Art Celebration, The Human Statue. Bookmark the permalink.